No polarity protection, no protection for reverse voltage. 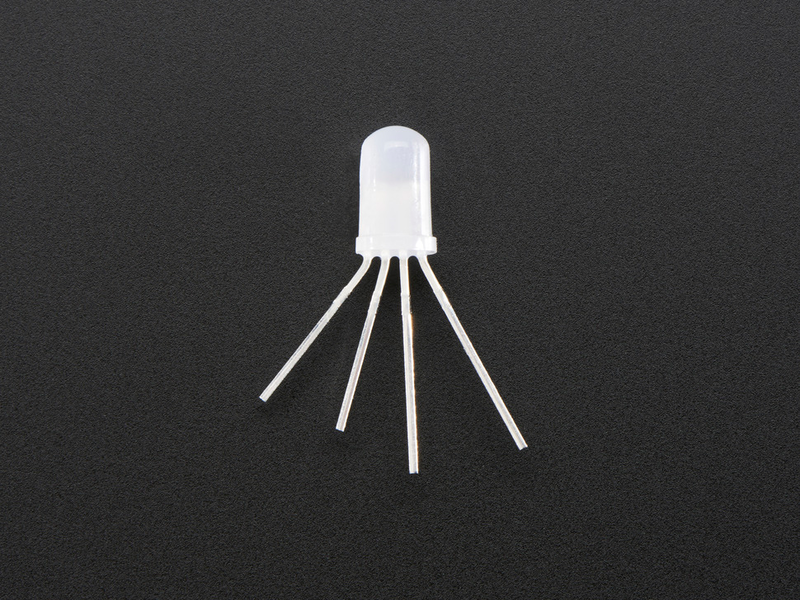 The pins can be identified by the length of the leads or by looking for the flat side of the LED. The DIN pin is the input signal pin. The DIN pin of the first LED in the chain should be connected to an I/O line of a microcontroller. 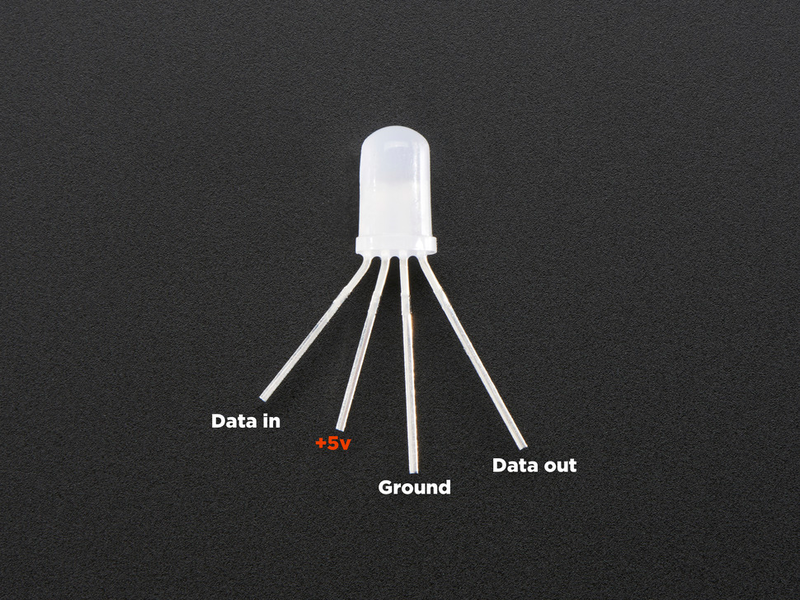 The 5V pin supplies power to the LED, and should be connected to a suitable 5 V power supply. The power supply should be capable of supplying enough current for all the LEDs it is powering. Each LED draws approximately 50 mA with all three channels at full brightness. The GND pin should be connected to the ground pin of the microcontroller that is controlling the LEDs and also the negative terminal of the power supply. 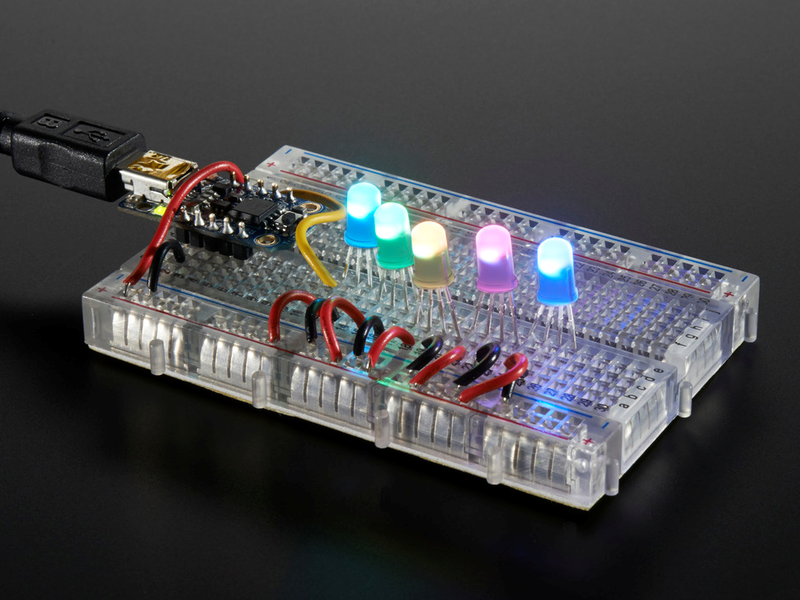 The DOUT pin is optional and allows you to chain multiple LEDs together. It can be connected directly to the DIN pin of the next LED in the chain. •Never supply more than 5 V to the LED. •Connect a capacitor of at least 10 μF between the ground and power lines. •Avoiding making or changing connections while the circuit is powered. •Minimize the length of the wires connecting your microcontroller to the LED. •Follow generally good engineering practices, such as taking precautions against electrostatic discharge (ESD). •Consider adding a 100 Ω to 1000 Ω resistor between your microcontroller’s data output and the LED to reduce the noise on that line and to avoid accidentally powering the LED through its data input. Warning: These LEDs can explode if they are pushed beyond their limits. For example, we were able to make an 8 mm LED explode by powering at 6 V and setting it to full brightness for about a minute (though we could not subsequently replicate that result). 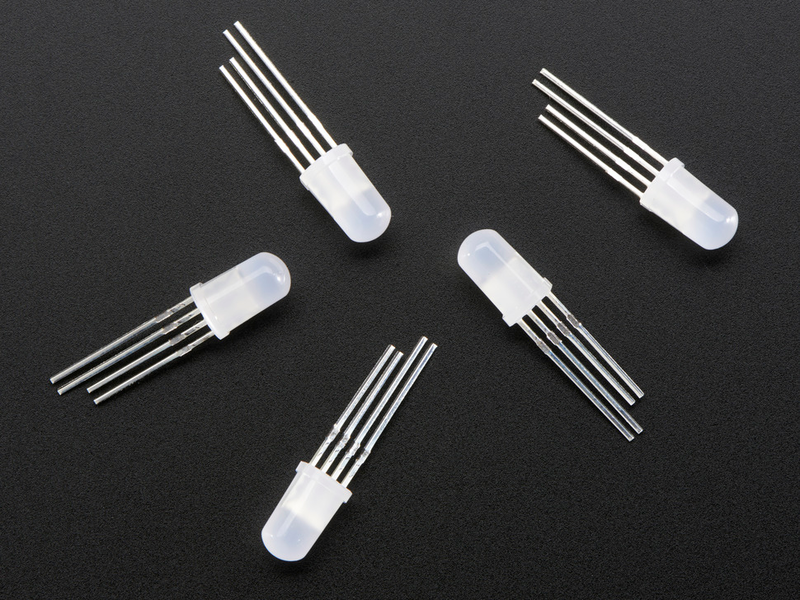 We strongly recommend you avoid powering these LEDs at voltages over 5 V.
After power is applied to these LEDs, they will emit bright blue light until the first color command is received. 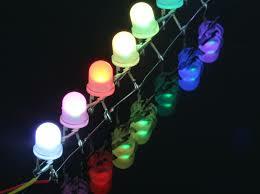 These LEDs can be chained with each other and also with other LED products that have a similar protocol. In particular, they can be chained with any of our WS281x-Based Addressable RGB LEDs. Even though these LEDs use a different color ordering than the WS2812B (RGB instead of GRB), they can still be chained to WS2812B-based products. These LEDs are controlled by a simple, high-speed one-wire protocol on the input signal line. The protocol is documented below. The default, idle state of the signal line is low. To update the LED colors, you need to transmit a series of high pulses on the signal line. Each high pulse encodes one bit: a short pulse (0.35 μs) represents a zero, while a long pulse (0.9 μs) . represents a one. The time between consecutive rising edges should be 1.25μs. After the bits are sent, the signal line should be held low for 50 μs to send a reset command, which makes the new color data take effect. 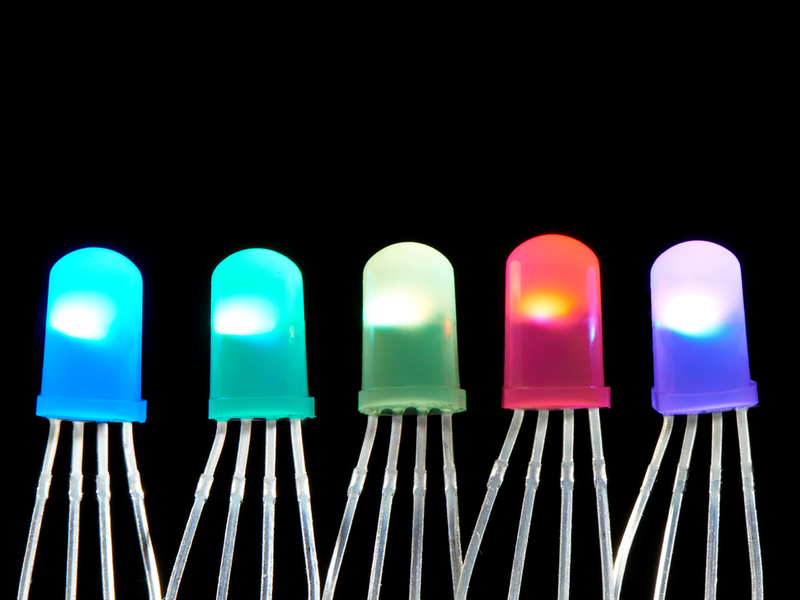 The color of each LED is encoded as three LED brightness values, which must be sent in RGB (red-green-blue) order. Each brightness value is encoded as a series of 8 bits, with the most significant bit being transmitted first, so each LED color takes 24 bits. 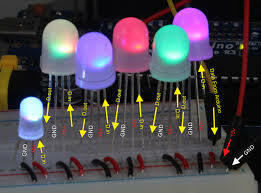 The first color transmitted applies to the LED that is closest to the control source, while the second color transmitted applies to the next LED in the chain, and so on. To update all the LEDs in the chain, you should send all the colors at once with no pauses. If you send fewer colors than the number of LEDs in the chain, then some LEDs near the end will not be updated. For example, to update 10 LEDs wired in a chain, you would send 240 bits encoded as high pulses and then hold the signal line low for 50 μs. The high-speed protocol of the driver allows for fast updates; our library for the Arduino below takes about 1.1 ms to update 30 LEDs. However, constant updates are not necessary; the LED can hold its state indefinitely as long as power remains connected. Implementing the protocol on a microcontroller. Since this LED does not use a standard protocol, a software bit-banging approach is usually needed to control it from a microcontroller. Because of the sub-microsecond timing, the bit-banging code generally needs to be written in assembly or very carefully optimized C, and interrupts will need to be disabled while sending data to the LEDs. If the interrupts in your code are fast enough, they can be enabled during periods where the signal line is low. It is generally not possible to generate the required control signals directly from older, slower microcontroller boards, like the Basic Stamp, or from processors that run full operating systems and can experience multithreading delays, like the Raspberry Pi.